We are a highly experienced team of framing specialists based in Kumeu, Auckland. We believe in providing the highest quality service to our customers, whether they are framing a Rugby Jersey, Family Photographs, Artwork, Sports Memorabilia and more. We interact with our customers on a constant basis, from the first time they walk through our doors, right through until we hand over their completed frames. We are also fully equipped to personally deliver your completed products in the Auckland region, and by courier to any other location around New Zealand. At The Picture Framing Company Ltd we utilize the latest in technological and equipment advances. We anticipate market trends and facilitate smooth, user-friendly ordering & supply systems for our customers in Auckland and Nationwide. Our Wizard Matcutting System is the pinnacle in precision cutting of matboards, our Inmes Double-Miter Saw facilitates the cutting of Frame Mouldings to the exact size required, and the Cassese Pneumatic Underpinner provides seamless joining of frame components. 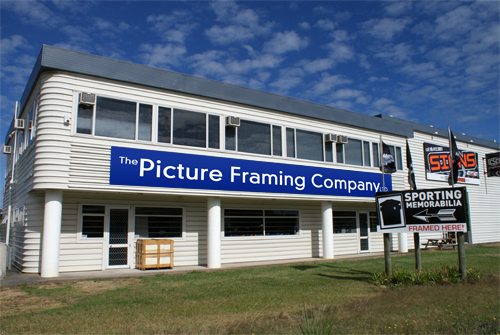 1994 - The Picture Framing Company Ltd began and remains as a completely New Zealand independently owned company. 2007 - FramingOnline.co.nz website is launched to provide for the steady rise in demand for frame purchasing online. 2013 - The Picture Framing Company website is relaunched, with a brand new look and functionality, so as to ensure our customers continue to know that we remain dedicated to providing them with the utmost in quality and service.